Welcome to the 2018 edition of the Virginia Business Meeting & Conference Planner. Each year, we showcase leading meeting locations in the commonwealth. Flip to page 39 to read features on Virginia’s unique meeting destinations, ranging from breathtaking mountains to sandy beaches and everything in between. The list on page 38 breaks down conference venues in the state by available meeting space in square feet, banquet capacity and other useful information. This year, in partnership with the Virginia Society of Association Executives (VSAE), we continue to honor the individuals who work behind the scenes to make meetings a success. 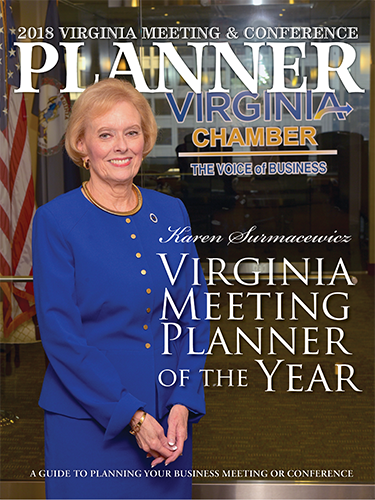 The 2018 Virginia Business Meeting Planner of the Year is Karen Surmacewicz, vice president of membership and event management for the Virginia Chamber of Commerce. Surmacewicz began working for the chamber in 1995 as a receptionist. Today her duties include managing several large events for the chamber, including its annual economic summit in Williamsburg, which last year attracted more than 900 participants. Click here to see why Surmacewicz is such a vital member of the chamber team. Overall, we hope this guide will make it easier to pick an ideal meeting spot. Virginia has several venues that will provide an immaculate setting for your next event.